Named after the iconic designs of Sir Edwin Lutyens, the Lutyens tables add an elegant yet decisively modern feel to any space. 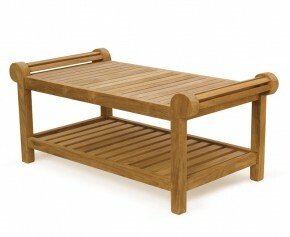 Featuring scrolled sides and two levels, these teak garden tables adds a touch of luxury to your home. Made from grade-A teak, our Lutyens tables are extremely durable and will last a life time through any weather conditions. This teak Lutyens coffee table is the perfect accessory to team with our Lutyens chairs and/or benches to create a stunning, formal setting for you and your guests. The Chinoiserie design was popular in the Arts and Crafts era and remains a favourite to this day. Able to be deployed indoors and outdoors, these teak garden tables require minimal maintenance and can be left outdoors all year round. Classic enough to compliment any existing furniture, yet also fantastic as a focal point, these teak garden tables are sure to fulfill your design desires. 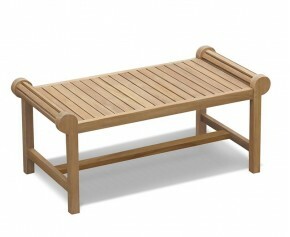 View our range of Lutyens tables here.